After 12 years of tremendous success raising money and awareness for the heart health of women in our community, the Jeanne Fuller Red Dress Charity Golf Classic is ALL NEW for 2019! What has always been an amazing day of friendship and golf for a good cause is now an amazing day of friendship and golf with professionals who will teach you to drive, chip, and putt like a pro! Hosted at the beautiful Loch March Golf and Country Club, the 13th Jeanne Fuller Red Dress Charity Golf Classic will once again be strictly “Ladies Day”. Proceeds raised will support programming at the Canadian Women's Heart Health Centre at the University of Ottawa Heart Institute. Quality of life is significantly lower for women than men after a cardiac event, and women who lack social support have a higher risk of fatal heart disease. The Women@Heart program, partially funded by proceeds from the Jeanne Fuller Red Dress Charity Golf Classic, is a peer support program led by women with heart disease, for women with heart disease. The Women@Heart program creates a caring environment for women to learn from each other and support one another on the road to recovery. Be part of the Jeanne Fuller Red Dress Charity Golf Classic, start the conversation about the importance of women’s heart health and save lives. You’ll be glad you did! All new format for 2019. Registration includes 9 holes and five clinics with professional golf instructors. As per usual the day will be filled with fun activities to par-take in including the Balloon Pop, Silent Auction/Live Auction, Corks and Caps, Fun Trivia and Photo Booth. 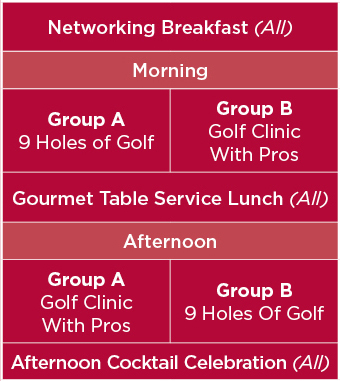 Don’t miss the chance to be part of the Jeanne Fuller Red Dress Charity Golf Classic, start the conversation about the importance of women’s heart health and save lives.